I write today to share the news that Blandin Foundation will formally conclude our Vital Forests/Vital Communities Initiative by the end of this year. Intended to have a 3-5 year life, VF/VC was launched in 2003 to strengthen and diversity Minnesota’s forest-based economy and promote the long-term ecological health of the forest resource that supports it. In deciding to conclude the initiative, Blandin Foundation Trustees reaffirmed the role our forests play in our healthy community strategies. Over the months remaining in 2009, project staff will work towards the smooth and successful conclusion and/or sustainable hand-off of VF/VC-initiated projects. Our goals include laying the groundwork for future actions by others on critical forest policy issues, honoring the leadership of key partners, and helping position others to continue the work through Vital Forests/Vital Communities. With the help of a series of assessment reports, the Foundation also intends to evaluate the initiative, identify lessons learned, and share them with partners in the forestry and philanthropy fields. Forests are important to Minnesota’s economy, environment and communities. Minnesota should make the necessary investments to improve the quantity, quality and value of our forests and the forest products and benefits they provide. The organizations that care about Minnesota’s forests have the leadership, vision and shared commitment necessary to meet this challenge. They deserve public support. We intend to work with partners, the VF/VC Advisory Board, and you, dear blog readers, to strategize on how best to deliver these core messages – and flag new and ongoing policy priorities – to audiences that matter. Together we’ve accomplished a lot – there is always more good work to do. As the late, former Governor Elmer Anderson often said, “You never lose when you pursue a worthy goal.” Minnesota has nothing to lose, and much to gain from continuing to focus on VF/VC’s worthy goal of promoting the connection between a healthy forest-based economy, healthy forest ecosystems, and healthy communities. Not to be confused with a community event that brings together lumberjacks and funnel cakes, organizers have started referring to the February 25-27 Forest Values and Carbon Markets: Opportunities for MN conference and MN SAF Winter Meeting as “Cloquet Forestry Days”. The agendas for both the conference and meeting are taking shape and available on the Blandin Foundation’s website, along with an online registration details. I don’t think funnel cakes are on the menu, but I hear that the celebration of the new forest tax law will include a cake of some sort. Clearwater County Land Commissioner Bruce Cox chimed in to clarify that MFRP’s definition concerns timber productivity. Indeed, the Vital Forests/Vital Communities Seeing the Forest AND the Trees project is intent on looking at productivity through the lens of all three forest “benefit baskets” – social, ecological and economic. Do you think that, as Harvey Tjader suggested in his blog comment, the secret formula to getting to this Holy Grail might be managing for diversity, in the forest and the industry itself? Do you think it’s possible to do both in Minnesota? And why or why not? 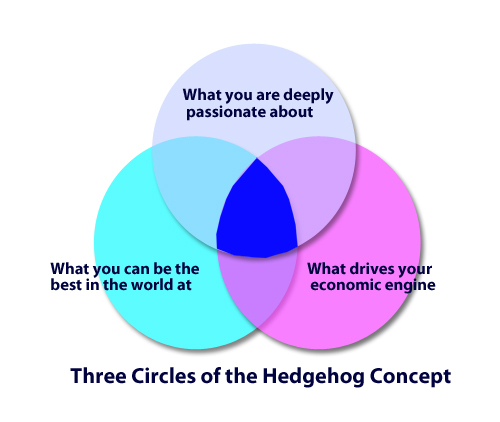 As global competition continues to challenge Minnesota’s forest products industry, policy makers and practitioners have a timely opportunity to ask: what is the hedgehog for Minnesota’s forests? This question got raised again a week or so later at an initial gathering of a group of folks who have signed on to participate in a study tour project with the foundation that we’re calling: “Seeing the Forest AND the Trees: How to Make the Most of Minnesota’s Woods.” The year long effort will involve study tours in the Great Lakes region and in Scandinavia. The project was originally framed around “improving forest productivity,” and as such we hope it can provide additional arms and legs and hearts and minds for the important work the Minnesota Forest Resources Partnership (MFRP) has undertaken with its productivity conference series. The Forest AND the Trees group is just getting started, and we’re at the stage of refining our learning objectives. We want to learn (from what we see in Scandinavia) how to maximize growth/yield while ensuring biologically diverse and sustainable forests. Carlton Owen, one of the study tour participants, spoke up right away to say that he thought we were barking up the wrong tree, so to speak. Carlton, who had joined us from Greenville South Carolina, is President and CEO of the US Endowment for Forestry and Communities. The Endowment was created in late 2006 with a commitment of $200 million arising from a softwood lumber trade agreement between Canada and the U.S.
Reminding us that the forest products industry is now a globalized sector, Carlton pointed out that given Minnesota’s soils and climate, our state will never be able to compete globally on yield, or on any quantitative measure of productivity. Minnesota’s forestry hedgehog, he proposed, was not in quantity of wood or fiber harvested, but in the quality of the trees grown and the quality of the products made from those trees. Please leave a reply below and share with us YOUR definition of “forest productivity.” Or any other thoughts you may have about Minnesota’s forestry hedgehog. Q: What do the Ruffed Grouse Society, The Conservation Fund, Minnesota Forestry Association, Forest Capital Partners, and 26 other organizations have in common? A: All have signed-on as sponsors of the upcoming Family Forest Stewardship Conference: Sustaining Our Commitment, Advancing the Agenda. If you’re planning to attend the conference and haven’t registered yet, please take a moment and do so now by visiting the conference web page. I’ve often heard it said that while most family forest land owners don’t identify timber management as a top priority for owning their land, most do end up harvesting timber for one reason or another. Sometimes the reason is financial, and sometimes it’s because the forest just starts to fall apart and obviously needs help. Like a garden, forests need tending to be productive and stay healthy, especially absent natural fire regimes. After lots of thought and planning, my brothers and I have contracted for a harvest next week of about 300 cords of over-mature aspen off our 40 acres in Lake Ponto Township in southern Cass County. With the help of our private consulting forester, we’ve used the DNR’s Field Guide to the Native Plan Communities of Minnesota to identify the land’s native plant community used that information to plan our harvest and regeneration strategy. And so, despite the “timber shock” we’re likely to experience when we see the woods again in the immediate aftermath of the cut (see MyMinnesotaWoods.org for a good discussion and images of what you can expect post-harvest), I can feel confident I’m being a good steward of our woods. Helping more of Minnesota’s family forest land owners be good stewards is the goal of the Family Forest Stewardship conference Blandin Foundation is sponsoring September 12-13 at Saint John’s University. More than thirty other organizations have joined us to embrace Vital Forests/Vital Communities’ ambitious goal to increase by one million the number of acres of family forestland in Minnesota under sustainable management by 2015. The work accomplished towards this goal in the past year is summarized in this Pre-Conference Backgrounder. As we come down the home stretch to the conference, our hearty planning committee, including Dovetail Partners’s Katie Fernholz, U of M Extension Educator Eli Sagor, DNR’s Gary Michael, and MFA’s Bruce ZumBahlen, are nailing down the final details of what promises to be a lively meeting. Besides foot tapping to the old time music of the Eelpout Stringers and touring Saint John’s Arboretum with one of my favorite Minnesota foresters, Tom Kroll, we’ll hear Pinchot Institute’s Catherine Mater and USFS Analyst Brett Butler discuss their ongoing research and new findings about what how most effectively to connect with family forest land owners. Most importantly, we’ll discuss – with your input – how to advance our agenda to improve stewardship on the 40 percent of Minnesota forest lands owned by families like yours and mine. After four years and nearly $8 million in investments , these questions are increasingly front and center for those of us working on Blandin Foundation’s VFVC Initiative. In service to the Initiative’s objectives and to the Foundation’s commitment to sharing our learning, we are launching this new VFVC Blog. We hope this tool will help us all advance our shared commitment to promoting the connections between a healthy forest-based economy, healthy forest ecosystems and healthy communities. One on-going focus of the Initiative is to encourage sustainable forestry, including by increasing the amount of forested land being managed under third-party certification programs. As part of this work, the Foundation has provided financial and operational support to six northern Minnesota counties – Becker, Beltrami, Carlton, Clearwater, Crow Wing and Koochiching – to cooperatively undertake the process of preparing themselves for certification. Photo above: County representatives participating in a work session, March, 2006. Recently, we commissioned an evaluation of this work to date. We are pleased to share the results with you here in the form of an Executive Summary or the Full Report. One of the study’s key findings is that the participating county land commissioners believe that “certification is the present and future of forest management.” Vital Forests/Vital Communities is eager to continue to be a resource for county and other certification efforts in our state, and we welcome your input as we figure out the best opportunities to do so. As we at Blandin contemplate the “So What?” question and deliberate on what to do next, we invite your comments and feedback.